I have invited several of my writing colleagues to share an essay in answer to this prompt: “What lingers in your memory about a specific place, perhaps a recent vacation or a place you’ve lived? How did this place, or your travels, influence your creative process?” Writer John Coy, who has traveled the world, writes about a geological feature very close to home. I’m working on a picture book about place like nothing I’ve done before. When I first started writing stories, I worked as a tour guide for the Minnesota Historical Society at Saint Anthony Falls in downtown Minneapolis. 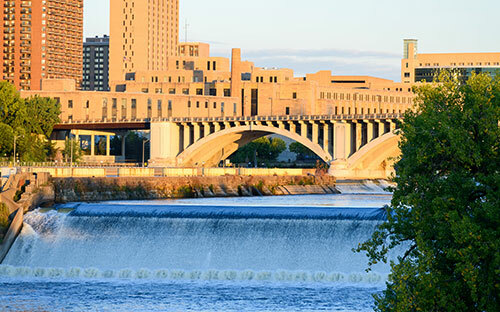 I became fascinated by the story of the only large waterfall on the Mississippi River and how it eroded upstream over twelve thousand years from what is now downtown St. Paul. Twenty-three years later, we have a contract for My Mighty Journey: A Waterfall’s Story. It’s first person waterfall, a category of books that is fairly limited. Gaylord Schanilec, the artist, is working with a team of other artists on stunning illustrations. 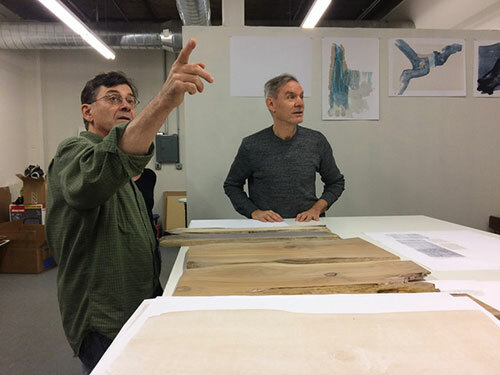 Gaylord agreed to make art for the book on two conditions: one, he and I would walk by the river over the course of a year, and two, we would not have a deadline for the project. The editor, Shannon Pennefeather, and I agreed to both. Having no deadline opened up opportunities to talk with many people. Europeans and their descendants have been here for less than three percent of the time people have lived by the Falls. We’ve been fortunate to work with Diane Wilson, Ernie Whiteman, and the team at Dream of Wild Health, a Native American farm that grows and gathers food using knowledge that’s been handed down for thousands of years. Diane and Ernie have generously shared their expertise and introduced new ways of seeing the waterfall, time, and how we live. We’re grateful to them and the Dakota and Ojibway people who have lived here for thousands of years for providing a deeper understanding of place. 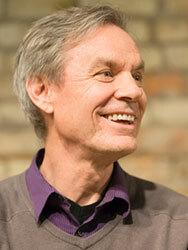 John Coy is the author of young adult novels, the 4 for 4 middle-grade series, and fiction and nonfiction picture books. He has received numerous awards for his work including a Marion Vannett Ridgway Award for best debut picture book, a Charlotte Zolotow Honor, Bank Street College Best Book of the Year, Notable Book for a Global Society, the Burr/Warzalla Award for Distinguished Achievement in Children’s Literature and the Kerlan Award in recognition of singular attainments in the creation of children’s literature. John lives in Minneapolis and visits schools around the world. Visit johncoy.com.